First of all you'll need a bag to carry around all of your belongings. 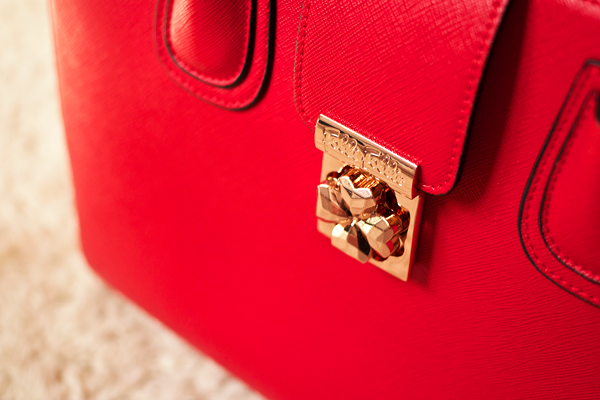 You'd be hard pressed to find a more beautiful one than the Heart4Heart Shoulder Bag*. I was so excited when this arrived in the post, this bag is just incredibly stunning! It is available in five different colours but I think the red looks best. It's so bright & Summery but will look stylish all year round. I love pairing monochrome outfits with colourful accessories like this. I adore the rose gold hardware, especially that clover shaped lock. Everything about the bag just screams quality. Not only does it look gorgeous but there is tons of room inside & plenty of compartments to keep everything organised. It feels sturdy yet lightweight so it's a brilliant choice for your travels. 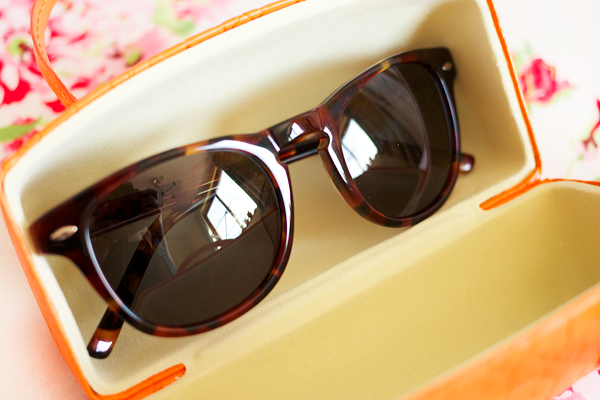 I was also sent these awesome tortoiseshell effect wayfarer sunglasses. How cute is the little orange case they came with?! The attention to detail is phenomenal. I really like how the four leaf clover theme is carried through their designs. The glasses feel very comfortable to wear & the lenses offer 100% UV ray protection. 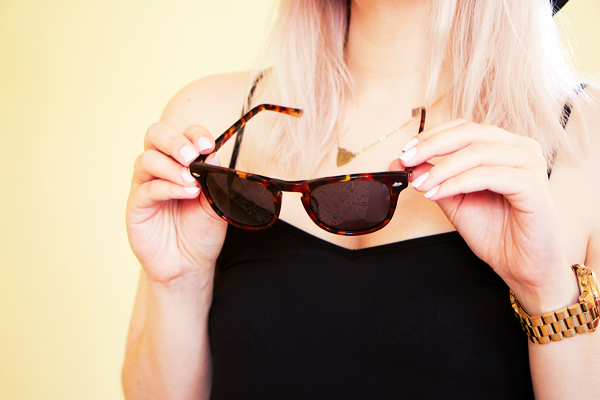 The wayfarer style is a classic & again the quality is top notch. 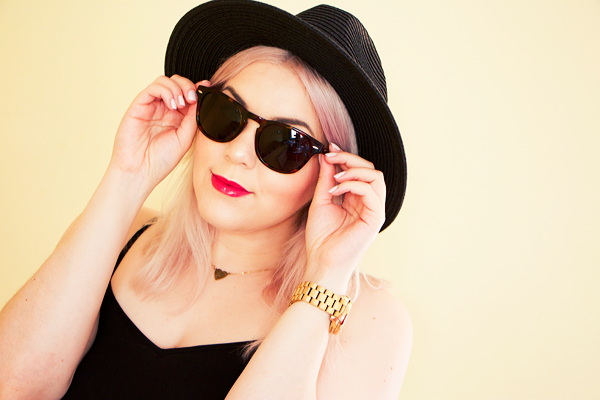 Something else I've loved wearing this Summer is my black straw fedora hat from River Island. It's helped to protect my bleached hair from the sun & provide some shade for my face. I think it finishes off an outfit rather nicely too! Although the UK weather is capable of doling out some wicked sunburn, we often don't see enough sun to develop a real tan. Even if you want to catch some rays you still need to wear some form of protection. Shiseido make some truly lovely sun protection products. I really like their Protective Tanning Cream N SPF 10*. It offers light protection & imparts a beautiful glow to the skin. The formula is very lightweight so it absorbs quickly & the tanner gives you a healthy looking natural golden colour. In a similar vein the Nivea Sun Protect & Bronze Spray SPF 10 contains a natural plant extract which helps support the production of melanin. Using this spray lotion will help to protect your skin & boost your ability to get a tan. If you're too busy for sunbathing then you can't beat a bit of fake tan. Admittedly I'm not a self tanning connoisseur but I've been very impressed with Lauren's Way Glam Tan*. The thought of tanning my whole body is quite scary to me but I've been using it on my legs to give them a bit of colour. The spray makes it very easy to apply & the colour is deep yet natural looking - not orange! If you're incredibly pale like me then you should probably stick to using products with a high SPF. Most people seem to forget that your lips can actually get sunburned so it's important to use a lip balm that can protect your lips. I love this strawberry lip balm from EOS*. This flavour doesn't have sun protection but their lemon drop lip balm boasts SPF 15 so make sure you get that one! The formula is deeply hydrating & feels lovely on the lips. 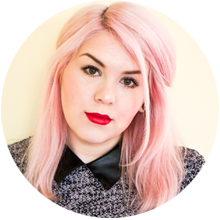 My favourite facial sunscreen is Soap & Glory's Sunshield Superfluid SPF 50. I use chemical exfoliants all year round so I always wear SPF 50 but it's especially important to protect your face during the Summer. I like this one because it doesn't leave a white cast, it doesn't feel greasy & it doesn't break me out. Check out my full review here. I always use this Nivea Sun Protect & Refresh Spray on my body. It offers SPF 50 & the spray is invisible so it won't leave horrid marks all over your clothes. It's easy to apply & feels cooling on the skin. I highly recommend it! I love spending time in the sun but sometimes the heat can make you feel gross & uncomfortable. 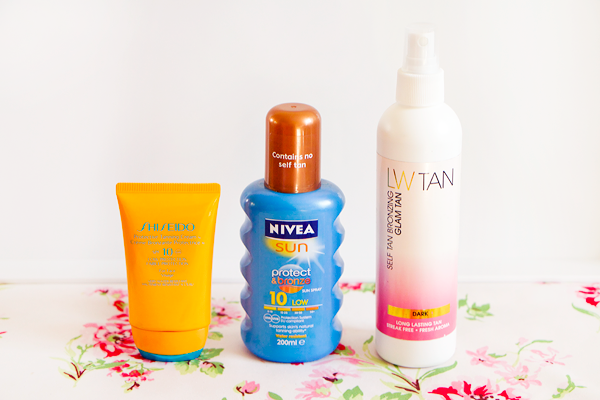 To make things a little more bearable during the recent heatwave I relied on these few products. The most important thing to carry with you is a bottle of water. It'll keep you hydrated and stocking up on them at home will save you a few pennies when you're out & about. It's a good idea to carry a dry shampoo with you during the Summer months. Sweaty hair is never a good look. 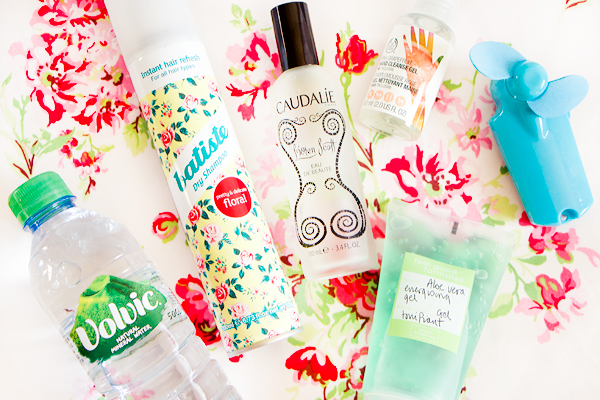 I always buy Batiste products because they're cheap & get the job done. I hadn't tried their Pretty & Delicate Floral Dry Shampoo* before but the scent is really sweet & feminine - a new fave! I love the packaging too. 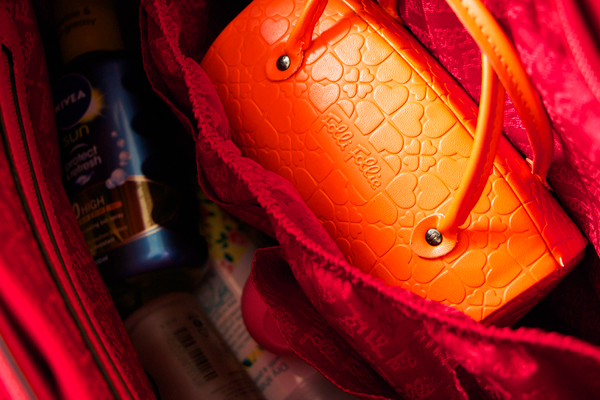 I couldn't live without a bottle of Caudalie Beauty Elixir in my handbag. It's the perfect facial refresher with an addictive herbal scent. I use it throughout the day to perk up my skin & clear my mind. After a few hours in the sun my body starts to feel overly hot & sticky. Arran Aromatics have come up with the best solution for this short of taking a cold shower. Their Aloe Vera Energising Gel* is a wonderful quick reinvigorator for the body. It instantly cools down the skin & works well on sunburn. I always carry a bottle of hand sanitiser with me. If you're eating on the go or having a picnic then you don't want mucky hands. I really like the ones from The Body Shop. They come in loads of different scents but I'm currently using the Pink Grapefruit Hand Cleanse Gel. It smells so nice! A little pocket fan like this one can feel terrific when you're getting hot & bothered. Spray the Beauty Elixir or rub on some of the body gel first then use the fan on those areas. Say hello to instantly cooler skin. Of course if everything goes wrong & the rest of the Summer is a washout then you'll need a good umbrella. 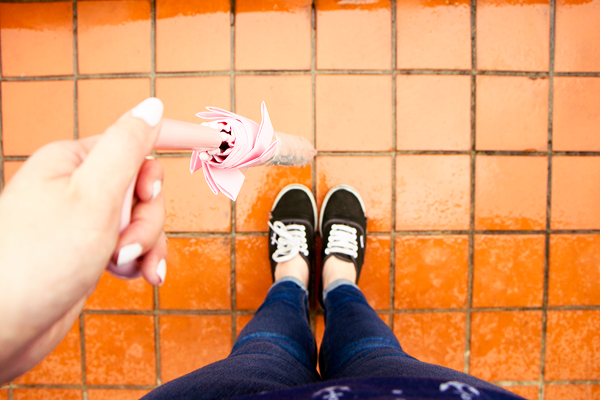 I really like cute bubble ones like this as they seem to keep the rain out much better than your average brolly. Even if it doesn't rain then an umbrella can double up as a parasol so you can chill out in the shade no matter where you are. 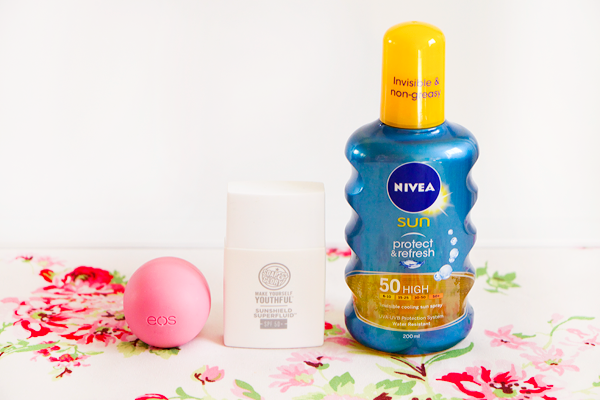 What are your British Summer essentials? The colours in these shots do things to me! Love that red bag. I use children's SPF 30 or 50 suncream. So pale. Your bag is stunning! Such lovely photos too! Great pics - love the bag! 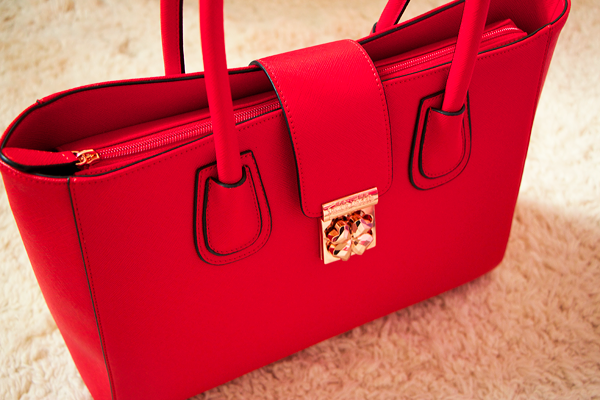 The heart for heart bag is stunning, i love the boldness of the colour. 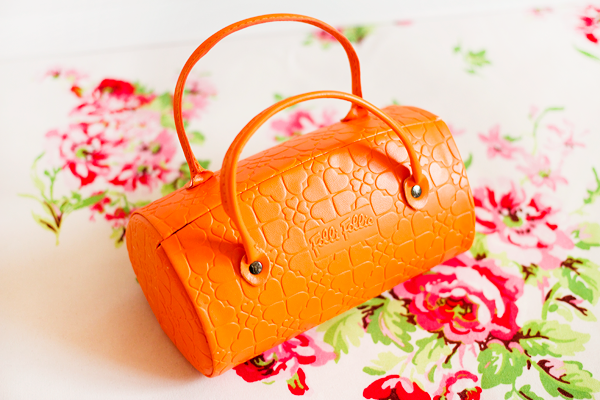 Every needs a bright bag in the life, perfect way to brighten up the English 'summer'! Beautiful bag, and I love that the sunnies come in a mini bag too! Adorable!